An aerial view of Gan Shmuel in Israel. Cronos Group is partnering with an Israeli collective settlement to grow medical marijuana in northern Israel, becoming what is believed to be the first Canadian MMJ producer to establish a production facility overseas for global exports. The partnership, announced Wednesday, brings together Toronto-based Cronos Group with Gan Shmuel, a kibbutz about 60 kilometers north of Tel Aviv that also owns a stake in an Israeli company that grows and sells citrus fruits. Cronos plans to export the MMJ to overseas markets and, once the project is built out, hopes to generate nearly 200 million Canadian dollars ($160 million) a year and produce up to 24,000 kilograms (52,911 pounds) of MMJ annually. The initial nine-month buildout will cost Cronos less than CA$10 million and produce 5,000 kilograms of MMJ annually. The second phase will start within a year and carries an unspecified price tag. The move comes after the Israeli government took steps last month to permit exports of MMJ. Cronos aims to capitalize on the low production costs Israel offers by way of labor, power and water. “We’re launching what we think is the most cost competitive export operation out there,” Cronos CEO Mike Gorenstein told Marijuana Business Daily. He expects the facility to be the largest in Israel and has the potential to top 100,000 kilograms annually. Gan Shmuel is one of only nine companies in Israel with authorization for nursery, cultivation, manufacturing and distribution. 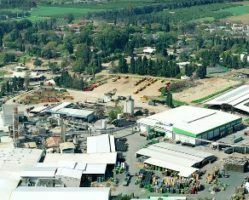 The kibbutz also is a partial owner of Gan Shmuel Foods, a publicly traded company that grows and sells citrus fruits for the Israeli beverage and food industry. Scott said Cronos’ strong connections to Israel were important in helping the deal come together. “Mike’s father was born near the kibbutz. The Cronos team has been to Israel many times personally and professionally. They have big active investors that live in Israel, and it was important to them to have a big part of Cronos’ operations be in Israel,” he said. In approving MMJ exports last month, a committee of representatives from the Israeli finance and health ministries estimated that the country’s economic potential from medical cannabis exports could reach 1 billion shekels to 4 billion shekels a year ($279 million-$1.1 billion). All common forms of medical cannabis will be eligible for export under the committee’s plan, which must be finalized by the Israeli cabinet. Cronos anticipates that will happen within the next several months, before the first phase of the project is complete. The CA$200 million revenue target is for when the first two phases of the project are built out. That figure assumes the MMJ can be sold for about CA$8 per gram, or the same as in Germany. Cronos exports MMJ to Germany and the Cayman Islands. For the first five years of the deal, starting from the first sale in Israel, 8% of the joint venture’s net income and CA$500,000 will be paid to Gan Shmuel and 92% to Cronos. After five years, that will change to 10% and 90%, respectively. Cronos will pump less than CA$10 million into the first phase of the joint venture, when it will produce 5,000 kilograms per year within nine months in a 45,000-square-foot greenhouse. The project will also include an 11,000-square-foot building for extraction, manufacturing, packaging and a vault. Construction for the second phase – when annual output will reach up to 24,000 kilograms – will begin in the next 12 months. The move by Cronos, which trades as MJN on the TSX Venture Exchange, comes as Canadian MMJ licensed producers have stormed overseas as more countries legalize marijuana for medical use. Companies have been exporting MMJ products, but Cronos is confident it’s the first to set up an overseas production facility. Twenty-three countries have active medical cannabis laws, while another 14 countries have pending laws, not counting the United States. A recent analysis by Toronto-based Eight Capital, a full-service investment dealer, pegs the potential global MMJ market at CA$180 billion ($142 billion) over the next 15 years. Cronos ultimately plans for the Israeli production facility to meet demand wherever new opportunities arise, including Germany. For Cronos, product costs are cheaper in Israel than in Canada. Gorenstein anticipates production costs of 40-50 cents per gram versus $1.50-$3 per gram in Canada. The Gan Shmuel kibbutz can produce its own electricity. The climate in Israel is less volatile than Canada’s. The kibbutz has its own water supply. The Gan Shmuel workforce is trained in agriculture production.